"I saw the helpless Cherokees arrested and dragged from their homes, and driven by bayonet into the stockades. And in the chill of a drizzling rain on an October morning I saw them loaded like cattle or sheep into wagons and started toward the west." made their journey of misery through this state. When settlers from Europe first landed on the east coast of America in the sixteenth century they found the ground to be fertile, well suited to farming, so they did not need to venture inland. As more and more settlers arrived they moved further into the interior in the quest for land to cultivate. It was difficult to cross the mountain range, which stood in the way, so for a time the Appalachians marked the frontier of settlement. When the first thirteen states formed the Union this was still the case, as even a cursory glance at a map will show. As more immigrants arrived from Europe pressure mounted for space, so brave pioneers crossed the mountains in search of new farming land. As a result of their longstanding contact with the newcomers the native peoples of the east had not only adjusted their attitudes and way of life to live side by side with them, many of them became embroiled in their struggles, and fought and died alongside them, be it British against French or British against American. Some intermarried extensively such that even within a family some integrated fully with the newcomers while others continued to live according to their traditional culture. Some became Christian, built schools to educate their children, and even established representative law making systems which emulated the democratic foundation of the United States. Once the Appalachian Mountains had been crossed settlers poured into the fertile lands beyond, having scant regard for the native Americans who lived there. Initially they were able to live side by side in the vast tracts of land that stretched westward until the very wide river provided another barrier to westward expansion. There was little reason to cross the Mississippi because the land beyond was considered to be of no use. One after another the eastern peoples were picked off: Delaware, Seneca, Shawnee, Ottawa, Choctaw, Sauk & Fox, Creek, Chickasaw, Cherokee, Seminole, Potawatomi. Unwillingly, they were mercilessly shifted from their homeland to the barren lands west of the Mississippi which the new Americans regarded to be of such use that it was labelled “The Great American Desert” on their maps at the time ‘removal’ took place. Following the revolutionary war 1776-1783 the newly independent United States, impoverished by the cost of the conflict, wanted to be able to raise revenue by selling off land, something it could not do when it was occupied, indeed owned by native Americans. The place to do this was Ohio, but while it was native American new American settlers just moved in, ignoring any legal title to it. The presence of the interlopers, estimated at 12,000, caused clashes with the indigenous peoples. Thus if the United States government could gain ‘legal’ ownership it could be justified as a move towards a peaceful resolution and result in a badly needed injection of funds into the Union treasury. In January, 1785 some of the Delaware, Ojibwe, Ottawa and Wyandot signed the Fort McIntosh Treaty. This acknowledged United States sovereignty in Ohio and agreed to a frontier at the Cuyahoga, Tuscarawas and Muskingum Rivers. Congress then sold the land rights to the Ohio Company and a New Jersey syndicate. A similar agreement was signed with the Shawnee at Fort Finney the following year. However, the chiefs who signed these treaties did not represent their people any more than the American commissioners had the will to control the encroachment of the frontier by its citizens. Incursions by both sides resulted in retaliatory action, so spasmodic armed conflict continued. “by the beginning of the nineteenth century red men were courteously arranging their own doom.” (2) In 1778.”the Delaware were promised that they would be able to head a state which would join the Union of ex British colonies. On the strength of this treaty they fought on the side of the Americans against the British. However nothing was ever to come of the reciprocal commitment. In 1809 the governor of Indiana territory, William Harrison, met with leaders of the Miami, Powatatomi and Delaware peoples at Fort Wayne. They ceded three million acres of land in central Indiana. In 1808 at Fort Clark, Kansas the Osage agreed to occupy a reservation farther west in present-day southern Kansas, giving up virtually the whole of Missouri today together with northern Arkansas. A similar ‘treaty of peace and friendship’ was made between the Kansa and the United States in 1815. They were then on Kansas River at the mouth of the Saline River, having been forced back from the Missouri by the Dakota. In 1818 Osage chiefs sold some of their land north of the Arkansas River. By the treaty of St Louis, June 3, 1825, the Kansa and Osage ceded to the United States their lands in Kansas, Arkansas, Oklahoma and Nebraska, and relinquished all claims they might have had to lands in Missouri, but reserving tracts for their use. Missouri had joined the Union in 1821. The land retained by the Kansa was a strip to the north of the Kansa River, while the Osage had a similar sized strip to the south, an area 50 miles wide and 125 miles long along the southern boundary of modern Kansas. In their new land they were relentlessly attacked by the Pawnee and others, such that their numbers fell substantially. The government’s idea was that the land between and south of these two peoples, west of the Mississippi, would be used to resettle the native Americans from the east. Although the outcome involved injustice, heartbreak, starvation, unnecessary suffering and fatalities, this was largely achieved by 1840. Despite fighting for the Union in the Civil War (3) the Osage were forced to sell their Kansas lands in 1871 and moved south across the border into Indian Territory. Two years later the land of the Kansa was sold, and with the funds another reservation was purchased in Indian Territory next to the Osage. In October 1811, Tecumseh tried to bring his vision of a united front to reality by canvassing others like the Cherokee Creek and Choctaw in the south. He left his brother, Tenskwatawa, clear instructions to await the massive confederacy which was Tecumseh’s dream. However, when William Harrison invaded the land near the Tippecanoe River Tenskwatawa engaged Harrison’s army with a force drawn from the Winnebago, Potawatomi and Kickapoo, but the alliance was defeated. When Tecumseh returned his efforts had been dashed. However in June 1812 an opportunity presented itself when the Americans and British declared war. Tecumseh led warriors from the Potawotomi, Kickapoo, Shawnee, and Delaware to fight with the British, and they were to be joined by bands of Wyandot, Ojibwe, Dakota, Winnebago and Sauk and Fox. However, by 1813 the British were in retreat, and in the face of Harrison’s army Tecumseh attempted a daring resistance in which he and many of his followers died. By the early nineteenth century most of the indigenous peoples of the south east who had long had contact with the new Americans: the Cherokee, Chickasaw, Choctaw, and Creek were split between those who wished to maintain their own traditions and those who were gradually integrating their culture with the newcomers. There was a considerable amount of intermarriage which contributed towards integration, peoples like the Creek and Cherokee were adaptable and learned by trading and interaction with the new Americans. They readily assimilated clothing, tools, weapons and farming methods which were suited to their needs. It was in this sense that they were ‘civilized’: that they had been open minded enough to assimilate aspects of the culture of the new Americans. It was to make no difference to the way they were treated by the new Americans. They were not interested in proselytizing their culture, the new Americans just wished to present it as being on a higher plane in order to justify them extending their ownership, wealth and power. From 1814 to 1824, eleven treaties were “agreed” by which the five “civilized tribes” ceded large parts of their lands in exchange for land on the Great Plains in a vain attempt to appease the Americans and, in doing so salvage at least some of their homelands and protect themselves from further incursion. By negotiating these treaties, with some amenable or corruptible leaders the United States claimed control of over three-quarters of Alabama and Florida, as well as parts of Georgia, Tennessee, Mississippi, Kentucky and North Carolina. The fact that so few Creeks, Cherokee and Choctaws moved westwards voluntarily during this period shows to what extent these were freely agreed treaties. They were actually devices by which the USA merely justified their imperialist actions by claiming that they were given legal title to the land. While the United States expressed freedom and democracy as its basic precepts whether this actually applied depended very much on what ethnic group one belonged to. At Artussee Jackson’s troops were re-enforced by Cherokee and Lower Creek warriors. The Redsticks were virtually wiped out at Horseshoe Bend on the Tallapoosa River. The Cherokee were prominent in the battle, capturing the Upper Creek canoes to enable their allies to cross the river and engage the enemy. Though they had helped him, Jackson still forced the Lower Creek to cede about 8 million acres, about two thirds of their land. (7) The surviving Upper Creek people joined the Seminole who, in 1814, were strongly resisting the Americans in the Florida swampland. This conflict escalated into full scale war in 1818. Florida was still claimed by Spain at this time. The Cherokee chief Tahlonteskee, having witnessed the slaughter at Horseshoe Bend, was convinced that moving west was inevitable, so in 1818 he requested that the American Board of Commissioners for Foreign Missions establish a mission in the west. Although Tahlonteskee died before the land was granted in Arkansas, his son John Jolly succeeded him as chief and led 300 of his people into the Great Plains to live next to the Osage. Being farmers, the Cherokee were so different to the Osage, who hunted buffalo, that they were not readily accepted. Conflicts were such that the Indian Agent Major Lovely negotiated further land to be transferred to the Cherokee from the Osage. This made it more likely that the rest of the Cherokee would be pressured to join their compatriots, despite their vehement resistance to the idea. Pressure mounted when the Bureau of Indian Affairs was created in 1824 as an arm of the War Department. “the bureau’s official business was described as the making of treaties to expedite exile” (8) When the Eastern Cherokee adopted a formal constitution for their nation in 1827 and declared themselves to be a sovereign nation. The state congress of Georgia responded by declaring this action illegal. They claimed it violated article 4 of the constitution of the United States, and argued that the Cherokee were tenants on state land. The state congress of Georgia then formally annexed Cherokee land. The Cherokee took their case to the Supreme Court, which ruled against them. Perhaps the critical trigger for removal came when gold was discovered on Cherokee land at Dahlonega, Georgia in 1828. Georgians poured onto Cherokee land. Jackson’s answer was the final piece in the jigsaw: the Removal Bill was put before congress in 1829. The Cherokee tried to use legal means to safeguard their rights. They sought protection from white settlers, who stole their livestock, burned their towns, and squatted on their land. In 1827 the Cherokee adopted a written constitution. They based this on United States policy; in former treaties, Indian nations had been declared sovereign so they would be legally capable of ceding their lands. Now the Cherokee hoped to use this status to their advantage. The state of Georgia, however, did not recognize their sovereign status, but saw them as tenants living on state land. The Cherokee again petitioned the Supreme Court in 1831. This time they based their appeal on an 1830 Georgia law which prohibited whites from living on Indian territory after March 31, 1831, without a license from the state. The state legislature had passed this law to justify removing white missionaries who were helping the Indians resist removal. The court this time decided in favor of the Cherokee. It stated that the Cherokee had the right to self-government, and declared Georgia's extension of state law over them to be unconstitutional. The state of Georgia refused to abide by the Court decision. By now the Removal Act had been passed and President Jackson refused to enforce the verdict of the Supreme Court. However much such opposition reaffirms one’s faith that not all the new Americans were behind the racist policies, they were clearly outnumbered, for in May 1830 the Great Removal Act was passed by Congress, albeit narrowly by 102-97 votes and President Jackson appended his signature on May 28. Jackson’s champion in the House of Representatives, William Lumpkin even had the nerve to refer to Jackson as “friend and father to the Indians”. (10) Jahoda p47 On an historical level it also clearly shows that in rejecting such arguments as Everitt’s , Jackson and his allies knew exactly what they were doing. Although it is often claimed that ignorance is no defence it is sometimes, in history, posited as an excuse. In this case it can be presented as neither defence nor excuse for those who passed these laws out of self interest did not do this in ignorance. In 1830 Ohio was ‘crowded’ with native peoples from the east who had been shifted thus far: Seneca, Delaware, Wyandot, Shawnee and Ottowa. The Seneca were the largest of the peoples which comprised the Iroquois League, the others being the Oneida, Mohawk, Onondaga, and Cayuga. The Delaware or Lenape had figured in no less than 15 treaties with the USA. between 1778 and 1818, and the Seneca had signed 11. All these treaties, as has been mentioned above, were doomed to failure. The native Americans were not represented fully at meetings and the US government either had no intention of keeping agreements or like the Indian chiefs, they had no power to make its citizens follow them either. Despite some of their leaders having signed away their Ohio lands in February 1831, in practice the Seneca were reluctant to leave. Harassed by the authorities, represented by sub agent Henry Brish, they eventually left in November on a tortuous journey in which most suffered from disease and malnutrition and many died, setting the pattern for subsequent removals. Joined by some Delaware en route they arrived Indian Territory, which would become Oklahoma, in July 1832 with no means of feeding themselves through the months to come. The next native peoples to be ‘picked off’ were Shawnee, Ottawa and the remaining Delaware. Again the start was delayed by uncertainty and the native people’s refusal to travel by riverboat. They were right to fear cholera because it was common. In practice, conditions on the trail meant they caught it anyway. Their problems were compounded by drunkenness from consuming cheap rotgut spirits in an attempt to forget their tragic circumstances. The group eventually travelled through Independence, Missouri, the gateway to the plains, on 30 November 1832. Twenty miles further west they came to the Shawnee destination. There were no tools to build homes which the government had promised. The Ottawa would go no further, refusing to travel the extra forty miles to the land which had been ‘allocated’ to them. The Choctaw had taken the side of the Americans against the British in 1812. They had fought with Andrew Jackson against the Upper Creek Redsticks on the Horseshoe Bend of the Tallapoosa River. It made no difference. They were accorded the same treatment. Andrew Jackson himself negotiated the removal to ensure that the terms were not too beneficial to the native Americans. Using the tried and tested methods of coercion and bribery with amenable chiefs the Treaty of Dancing Rabbit Creek, September 1830, exchanged their homelands in Alabama and Mississippi for land in western Arkansas. Their removal began in the autumn of 1831, and an advance exploring group sent back good reports of fertile land and the availability of buffalo and wild turkey. However, once again the journey of those removed was wracked by disease, cholera, influenza and pneumonia, hunger and extreme weather conditions. Of approximately 18,000 Choctaws who began the journey about one third of them perished. To make matters worse, when they established their homes and cornfields on the Arkansas River it flooded its banks and destroyed what they had worked so hard to create. Originally from Upper Michigan, the Sauk and Fox had been driven south by the Iroquois, the French and the Ojibwe. The two peoples lived together and established a city, Saukenuk, of wooden dwellings, 30 -100 feet long in clearly defined streets. Their economy was based on agriculture, mining ore (the Fox were smelters) and hunting furs to trade for equipment. Indian agents oversaw the trade and, during his presidency, Jefferson told them to encourage native American chiefs to get into debt, professing that this policy would result in them being willing to cede land. While this was devious it was almost fair compared with the injustice which was to come. In 1832 Black Hawk refused to surrender the Sauk and Fox lands in western Illinois. The state of Illinois invoked the treaty of 1804, but the Sauk and Fox did not recognize this treaty. William Henry Harrison, the American governor of the Indiana territory had induced a few Sauk, including Quashquami, was not even a chief, to sign away ten million acres of northeast Missouri and western Illinois. All this for $2,500 in presents and a $1,000 annuity over 20 years. Although initially successful at the Battle of Sycamore Creek, when 400 whisky soaked militiamen ran before forty Sauk warriors, Black Hawk’s people were forced to retreat. A group led by Black Hawk was caught in a crossfire between the east bank and a gunboat on the river near the mouth of the Blood Axe River, a tributary of the Mississippi. Black Hawk’s attempts to surrender were ignored and warriors were shot down with their families. Subsequent atrocities committed did not distinguish between the genders and ages of those butchered. How could anyone call this the Battle of Bad Axe River? The decimated and demoralized Sauk were forced to cede their remaining lands in Illinois as well as parts of eastern Iowa. In the aftermath, pressure built to remove the other tribes from Illinois. At the Treaty of Chicago in 1833, the Ojibwe, Ottawa, and Potawatomi in northern Illinois ceded their remaining lands and agreed to move to Council Bluffs on the Missouri River in southwest Iowa. After a few years, the Illinois Ojibwe merged with the more-numerous prairie Potawatomi. The combined tribe was forced from Iowa in 1846 and removed to eastern Kansas. Despite being subjected to harassment and the illegal occupation of their land in Alabama, starving and despairing, the Creek still refused to budge. The situation was so desperate they ate the bark off the trees. Hoping to alleviate the stress and bring their hapless position to an end, they signed a treaty in March 1832, which opened a large tract of their Alabama land to white settlement, but guaranteed themselves ownership of the remainder. Contrary to the legal wording, the government did not prevent further theft of their land, which continued, unabated. In 1834-5 many were defrauded of their land by unscrupulous speculators. By 1835 the Creek were so poor they began stealing livestock and crops from white settlers. Some even retaliated by raiding the landgrabbers, burning their homes and property, taking food and killing the squatters. In 1836 the Secretary of War ordered the removal of the Creek as a military necessity, so General Jesup led in eleven thousand troops against Eneah Mico’s eight hundred underfed Creek warriors. Identified as ‘hostiles’, they were manacled and chained before being transported. In 1836 22,000 Creek people were forcibly moved. It has been estimated that about half of them died on the journey west from exposure, malnutrition or disease (mostly dysentery and cholera) or in most cases probably a combination of all three. 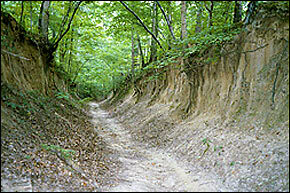 By 1837, approximately 15,000 Creek people had migrated west. They never did sign a removal treaty. The Chickasaw was a very aggressive offshoot of the Choctaw who were feared by neighbouring peoples. Like the Creek they signed a treaty in 1832 by which they agreed to move to new lands in the west and the United States government agreed to protect them until they moved. Once again the federal government reneged on its promise. Moving in winter 1837-38, the journey was the by now familiar heart rending debacle. Wagons were lost crossing the Mississippi, and disease, starvation and the elements took their toll. When they arrived on the banks of the Clear Boggy River smallpox broke out and decimated those who remained. The United States government reneged on its other promise, to provide land on which they could settle. Therefore they were forced to lease land from the Choctaw and almost lost their tribal identity as a consequence. However, by 1855 they had negotiated to buy the land and so became a discernible people again, until the US government stepped in again in 1907 to appropriate the land for the new state of Oklahoma. The Cherokee, like so many before them, were cheated. They thought that their embrace of the culture of the new Americans would count for something, unfortunately they were wrong. The Supreme Court ignored such protests, which clearly gave the members of the highest court of appeal more credit than they deserved. Instead it ratified the treaty in 1836, which had been signed by the previously vociferous opponents of removal led by John Ridge and Elias Boudinot. The Cherokee were given two years to migrate ‘voluntarily’, at the end of which time they would be forcibly removed. The ‘Ridge’, his son John Ridge, and Boudinot now grabbed the opportunity to receive the rewards for leading the way, with their laden oxen drawn wagons and their black slaves and horses, to the new lands in Indian Territory, Oklahoma. By 1838 only 2,000 had migrated; 16,000 remained on their land. The U.S. government sent in General Winfield Scott with 7,000 troops, who forced the Cherokee into stockades at bayonet point. They were not allowed time to gather their belongings, and, as they left, whites looted their homes. Georgians accused the Seminole of harbouring runaway slaves in Florida, which, at the time of independence, was claimed by Spain. The presence of the fugitive slaves enraged white planters and fuelled their desire to defeat the Seminole. It also suited the US government to put pressure on the Spanish government, whose hold on the area was severely weakened by armed insurrection in its Mexican colony. US troops under Andrew Jackson were sent into Florida in 1817, ostensibly to address the problem of the escaped slaves. The First Seminole War lasted until 1818 and subsequently the US purchased Florida from Spain in 1821, the same year Mexico gained its independence. Coacoochee and his people finally gave up in 1841, but some fought on, never to give up, even surviving the Third Seminole War (1855-58), when the U.S. military attempted to drive them out. The United States paid some of the remaining Seminoles to move west, but others stayed put, hiding away in the mangrove swamps. Their descendents still live in Florida today. Thousands of lives were lost in the Second Seminole War. It cost the Jackson administration approximately 40 to 60 million dollars - ten times the amount it had allotted for the whole of ‘Indian removal’. It was the most costly ‘Indian War’ in United States history. In the eastern parts of the continent everywhere the story was the same. The citizens of the United States wanted the land and its government used the tyranny of the Law to support their avarice. A newly formed nation which was founded on high flown principles of freedom, democracy and human rights was comfortable in selectively applying those principles only to themselves. The indigenous people were uprooted from their homelands which had often been promised to them in perpetuity and forced to move in unhealthy conditions which encouraged sickness and death. This took place without compensation. However the inhumanity of the removal policy was not a closely guarded secret, even though its application often involved deceit. To alleviate their consciences the policy makers used the law to justify the unjust, and in the debate some new Americans stood up and explained the injustice for what it was, thereby ensuring that the real issues were made public. Nevertheless, moral questions were blithely ignored in favour of self interest, profit and greed. Despite the fact that these peoples had lived in harmony with their surroundings for centuries, many of them employing sophisticated, successful farming techniques, an ideological construct was formed to sanction the legality of theft. Manifest Destiny proclaimed that these savages were not fit to have title to land which the new Americans would exploit so much more efficiently and effectively. The consequences of a speedy removal will be important to the United States, to individual States, and to the Indians themselves. The pecuniary advantages which it promises to the Government are the least of its recommendations. It puts an end to all possible danger of collision between the authorities of the General and State Governments on account of the Indians. It will place a dense and civilized population in large tracts of country now occupied by a few savage hunters…….. Conclusion 3. Why were so many treaties signed? By 1837, the Jackson administration had “removed” 46,000 native Americans from their land east of the Mississippi, and had secured treaties which led to the removal of a slightly larger number. Most members of the five southeastern nations had been relocated west, and this alone opened up 25 million acres of land to white settlement and to slavery. 13. Memorial of the Cherokee Nation to the United States Congress Dec 29 1835, quoted in Jahoda, p 209. 14. Samuel Cloud’s, age 9, account as passed down through generations and written down in Forgiveness in the Age of Forgetfulness by Michael J. Rutledge, 1995 - see the link to History of the Cherokee. Read the full account if you can bear to discover why each day as he passes by Michael spits on the statue of Andrew Jackson. I am surprised that the statue has not been smashed.